The Cloghane / Brandon area, also known as an Leith Triúigh is located on the northern tip of the Dingle Peninsula. The two villages are set in a semicircle of mountain peaks and overlook beautiful Brandon Bay. There are many rivers, lakes, streams, and waterfalls, and the landscape varies from mountain pass to peak to bog-clad valley floor. This is a Gaeltacht region, where the Irish language is spoken by everyone, an area rich in language, music and dance. The area has an abundance of flora, with Arctic alpines growing near the peaks of Mt Brandon, and many seaside flowers growing on the sandy shores of the bay. The Cloghane / Brandon area is one of great natural beauty, between the mountains and the Atlantic. It has an abundance of sandy beaches, washed clean by the surf of Brandon Bay. The area is rural with two small villages: Cloghane, a picturesque small village of stone houses overlooking the Owenmore estuary; and Brandon, a small fishing village, overlooking Brandon Bay, with a quay still used by local fishermen. 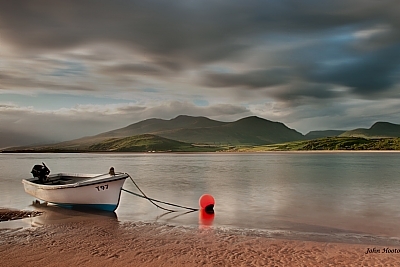 The area boasts the Conor Pass, which offers extraordinary views over large parts of the Dingle Peninsula. The area also boasts the longest beach in Ireland, which starts in Cloghane and runs unbroken through Fermoyle, Castlegregory, and down the Maharees peninsula. There is also the secluded Trá Bhán (white strand), the distinctive red sand of Ballyquin beach, and the stunning Cappagh beach with its own swimming pool at low tide (enquire locally about safe swimming locations and times). There is an abundance of walking trails here, and the climb to the summit of Mt Brandon is very popular. Most of the walks offer spectacular views over lakes, bogs, rivers, waterfalls, mountains, the bay, and the estuary. The mountains around the area harbour deserted villages and uninhabited valleys and offer an almost unique wilderness, in stark contract to the stress of everyday living. On the last weekend in July, the festival of Lughnasa is held, with a wide variety of entertainment available. The highlight of this weekend is the ascent of Mt Brandon, with music and poetry reading and a picnic at its peak with the world at your feet — never to be forgotten. On the Sunday, the Cloghane Pattern is celebrated with the festivities moving to Brandon on the Monday night. Sheep shearing, dog trials, traditional meat pies, face painting, street entertainers, open air dancing, and music and poetry readings are just some of what is on offer. Of course, pints of Guinness and traditional sessions can be found in all the local pubs over the weekend, and indeed, throughout the year. The Brandon Regatta is held on one of the last Sundays in August every year. This is a series of curragh (boat) races with many different categories. Contesting boat teams travel right up the west coast, and winners and losers alike celebrate with music and song afterwards. There are several traditional pubs in the area with many of them serving fine food, some specialising in locally-caught seafood. Sessions of music, song, and dance are held nightly in most of the local pubs, where young and old, tourist and local, blend together to create a unique atmosphere. Pony trekking, scuba diving, windsurfing, canoeing and waterskiing are available in Castlegregory village and on the Maharees peninsula, about a five-minute drive away.